FREE SIZE: 22cm*28cm when wearing. Roomy enough ,suitable for any adult or child.One size fits most. BREATHABLE AND COMFORTABLE: 2 eyes holes under the eyes for watching, 2 nose holes and 1 mouth hole for breathing. 185g, lightweight.Comfortable to wear. SAFETY MATERIAL: Made from natural latex,non-toxic. High quality, environment. TRUE-TO-LIFE DESIGN: Carrion head,blooding,scar,prominent eyes. The zombie is coming to you,give a fright to others! 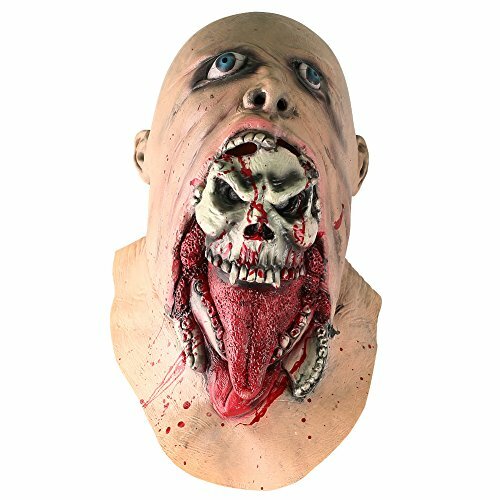 BEST CHOICE AS GIFT: Halloween, Christmas, Easter, Carnival, Costume parties, or Cosplay Party , give others the scariest memory for the night with this mask!